We printed a selection of social stationery for a newly-married couple. The clients selected a few different designs and cardstocks. To add another layer of customization, they selected a beautiful printed paper from Paper Source and we used it to line their envelopes. This is a great option to add individuality to your stationery. It adds some lovely visual appeal as the recipient opens the envelope and also complements the ink used for the letterpress printing. As you can see, there's more of that gorgeous calligraphy. We're most excited about the custom envelope liners that we printed! 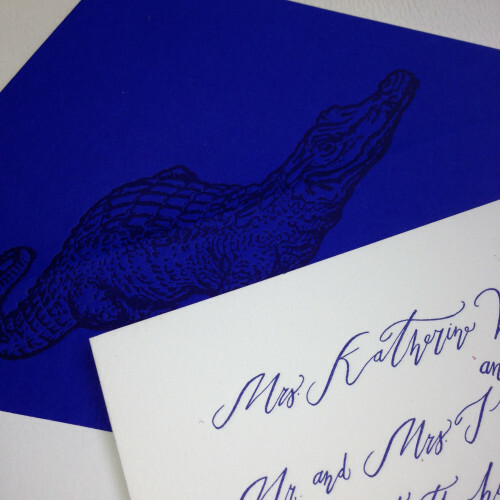 We love how guests will open the envelope flap and see the alligator printed onto that vibrant purple-y blue! 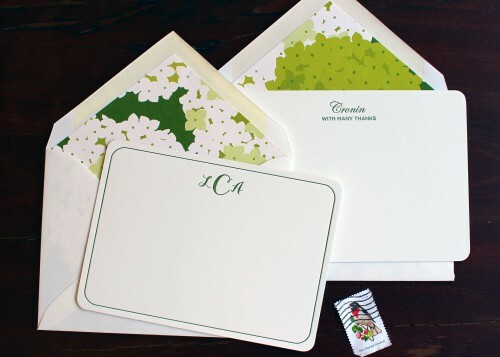 Custom envelope liners are a great way to make your invitation stand out. We can print a monogram, a pattern or the motif of your choice.